Where in the world is Austen Acevedo? The teenager calls Orlando home but in the past two months he has danced with the world’s best, first at a prestigious competition in Switzerland and then as the first U.S. student invited to a famed Russian ballet festival. In June, Austen will perform at the Gala de Danza in Mexico and he has been asked to return to Russia. “It’s been … amazing,” said Austen, 15, who has studied at Orlando Ballet School since he was 10. But Austen has no time to rest on his laurels. In just a few days, he’ll be competing in the Youth America Grand Prix finals in New York City [April 10-15, 2015], the premier annual student ballet contest in the U.S. To get there, he finished on top in three categories during regional semifinals this spring. 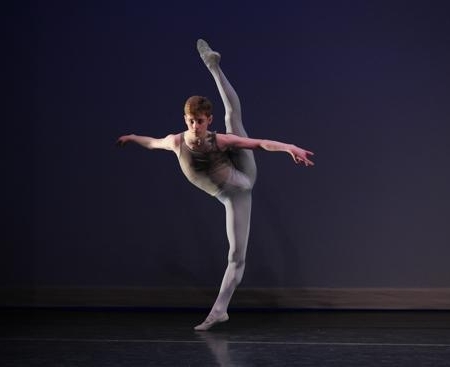 Although Austen already has been accepted as a merit training scholar at an American Ballet Theatre summer program in New York, the Grand Prix could lead to other offers and scholarships. Whatever the result, it will be hard to top the thrill of dancing in the historic Mariinsky Theatre in Russia. “It had always been a dream of mine,” Austen said. Founded in St. Petersburg in the mid-18th century, the Mariinsky troupe developed its stellar reputation during the Soviet era, when it was known worldwide as the Kirov Ballet. Austen was dancing at a gala in Miami when he caught the eye of Californian instructor Christina Lyon. “His musicality, technique and partnering skills were that of a seasoned professional,” said Lyon, who trained as a teenager at Moscow’s Bolshoi Ballet Academy. She set the wheels in motion for the invitation to St. Petersburg. Russian media picked up the story. One television correspondent said Austen and Kennedy, 14, had the athleticism and artistry to adapt to Russian choreography “on the fly,” noting that training techniques vary greatly in the two countries. Hard work was what got Austen into the exclusive Prix de Lausanne in Switzerland in February. Only 70 dancers in the world are considered; just 20 are invited to the finals. “It’s the crème de la crème of student competitions,” Burger said. Austen, who is home-schooled, lives with his dad, Andres Acevedo of Orlando. The teen will next perform locally at Orlando Ballet School’s “Stars of Tomorrow” program on May 15. 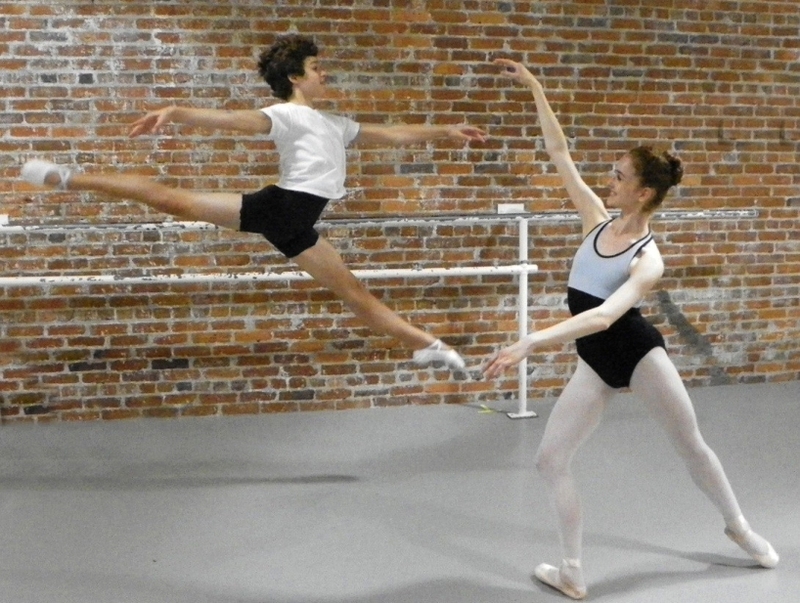 [Orlando, Florida, USA] – Talented Orlando Ballet School students Austen Acevedo and Gabriella Stilo have been selected to compete at the prestigious 2015 Prix de Lausanne from February 1-8, 2015, in Lausanne, Switzerland. Acevedo and Stilo received the coveted designation, and are two of the 67 students from among 300 worldwide applicants to be accepted to the competition. Prix De Lausanne is the most exclusive student ballet dance competition in the world. 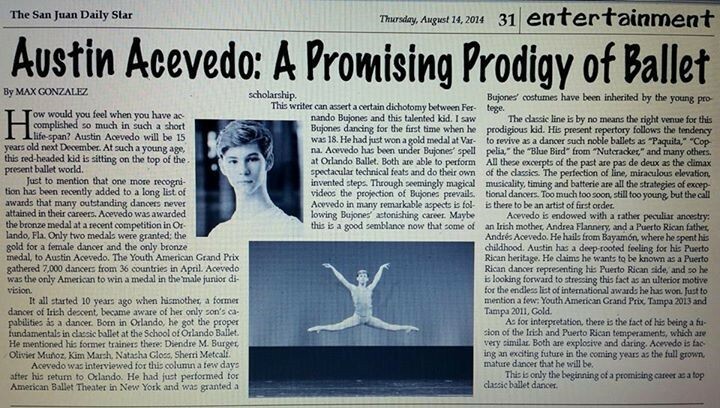 Now 15, Acevedo has been training with Orlando Ballet School since age 10. He is the only United States junior male to place in the top three at YAGP 2014 in NYC. Acevedo has won the Junior Grand Prix at the YAGP Tampa regional semi-finals and the Bronze at World Ballet Competition 2014. He is an American Ballet Theatre Merit Scholar for 2013 and 2014. Acevedo has danced in several Orlando Ballet professional productions including Carmen and Vampire’s Ball. 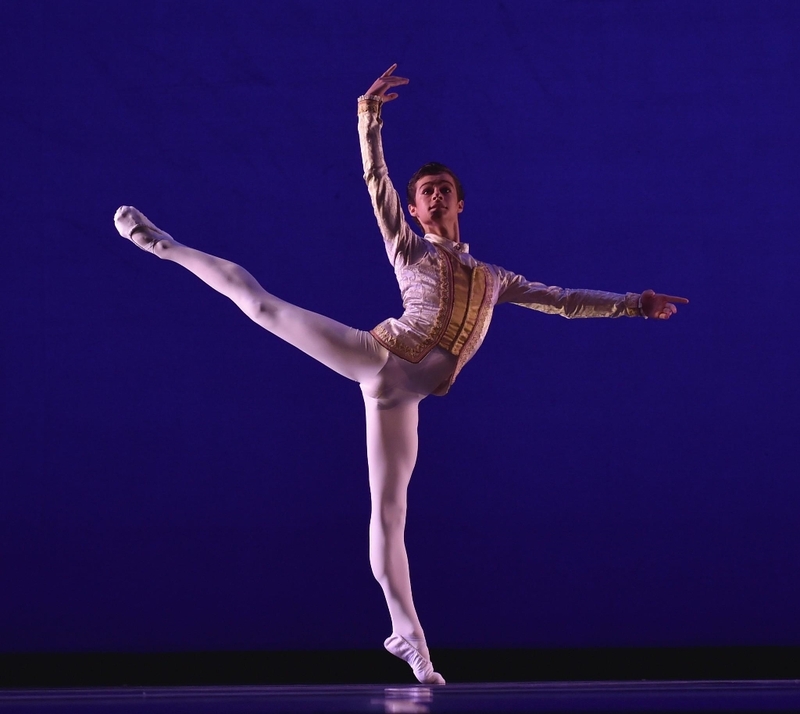 Acevedo is only one of seven American male dancers selected to compete at the 2015 Prix de Lausanne. Also 15, Stilo is originally from Tampa and relocated to Orlando in August 2014 specifically to train at Orlando Ballet School. Stilo has won the YAGP Grishko Model Search 2014, placed first in the pas de deux category at YAGP NY Finals 2014, won the Junior Grand at the YAGP Atlanta regional semi-finals and won the Junior American Dance Competition Grand Prize in 2013. Both Acevedo and Stilo are raising funds for their trip to Switzerland for the competition. If you’d like to support Acevedo on his journey to compete in Switzerland, please visit www.gofundme.com/austenacevedo. If you’d like to support Stilo on her journey to the 2015 Prix de Lausanne, please visit her site at www.gofundme.com/ids1i4. For more information on the 2015 Prix De Lausanne, please visit www.prixdelausanne.org. I am so excited to announce that I have qualified to compete in one of the most prestigious ballet competitions in the entire world, the Prix de Lausanne, in Switzerland. Only 80 young dancers from around the globe are invited to compete. I will proudly represent the United States of America as well as Puerto Rico! There are many incredible benefits to being a competitor in this competition. The potential scholarship opportunities would help me complete my ballet training in New York City or Europe. This training is essential to my artistic and technical development, which will eventually allow me to become a professional ballet dancer! In order to make this trip a reality I will need the help of family, friends and ballet lovers! Your donations will assist my costs of travel, hotel stay, food, costumes, coaches travel expenses and training needed to compete. We are so very grateful for your donations. Please know that no donation is too small! You’re thoughts and support are just as important! But, in an embarrassment of riches, Kessler is already committed other prestigious programs. Next week he will be attending the Paris Opera School in France on a full scholarship, which he won this year at the Youth America Grand Prix competition in New York, reports Dierdre Miles Burger, head of the Orlando Ballet School, where he studies. From there, he goes to San FranciscoHYPERLINK \l “” Ballet where he will attend the summer program on full scholarship and stay as a trainee for the 2014-2015 season — another honor that he received at the Grand Prix. Kessler was among 31 dancers who performed classical and contemporary routines at the final round of the USA International Ballet competition, which takes place every four years in Jackson, Miss. More than 300 applied to compete; Kessler won in the male junior division. He told competition officials his favorite role thus far has been performing as Franz in the Orlando Ballet II production of “Coppelia.” Orlando Ballet II is the junior division of Orlando Ballet. “In the next three years I would love to be in a company, and the San Francisco Ballet would probably be my first choice,” Kessler says. Although he says he prefers classical technique to contemporary, he has been lauded in both areas. He practices six hours daily, and already has acquired a string of accolades. This spring, he placed third at the Youth America Grand Prix competition in his division, notable as he was on the young end of the eligible 15-19 age range. The YAGP is a well-known yearly worldwide dance competition with finals in New York City. In 2013, he won a gold medal with fellow Orlando Ballet School students Jessica Assef and Mario Chimal in the ensembles category at the Youth America Grand Prix. [As] a 14-year-old, in 2012, Kessler won the Junior Grand Prix award there — the top award for all dancers in the 12-14 age bracket. With that honor, he received a full scholarship to the summer session of the Royal Ballet Company in London. Kessler shared his tips for success with officials at the USA International Ballet Competition: Work hard, even if tired, and always listen to instructions from dance teachers — a nice tribute to his instructors at Orlando Ballet School. [Orlando, Florida, USA] – Despite a tumultuous year for the Orlando Ballet School, several students were honored at the Youth American Grand Prix semifinal competition this month in Tampa. Among the top finishers were Austen Acevedo, who won the Junior Grand Prix, the highest award in his age group; and Blake Kessler, who took first place for both classical and contemporary dance in the senior men category. The dancers will advance to the finals in New York in April. The Youth America Grand Prix, founded in 1999, is the world’s largest international ballet competition that awards full scholarships and job contracts to dancers from age 9 to 19. In 2012, Kessler won the national Junior Grand Prix award. Orlando Ballet School’s main location was forced to close in August after mold was discovered in the building, a former power plant owned by Orange Utility Commission. Some classes were cancelled; others were rescheduled or moved to other locations. The ballet has since rented warehouse space near Loch Haven Park and in mid-December converted the facility into a new school. • Ryland Acree III: Third place, senior men, classical. In addition, “Red Light,” choreographed by Orlando Ballet artistic director Robert Hill, was awarded second place in the ensembles category. The Orlando Ballet School, considered one of the greatest training academies in the world, had an extremely successful week at the Youth America Grand Prix International Student Ballet and Contemporary Dance competition in New York City, April 22-28. 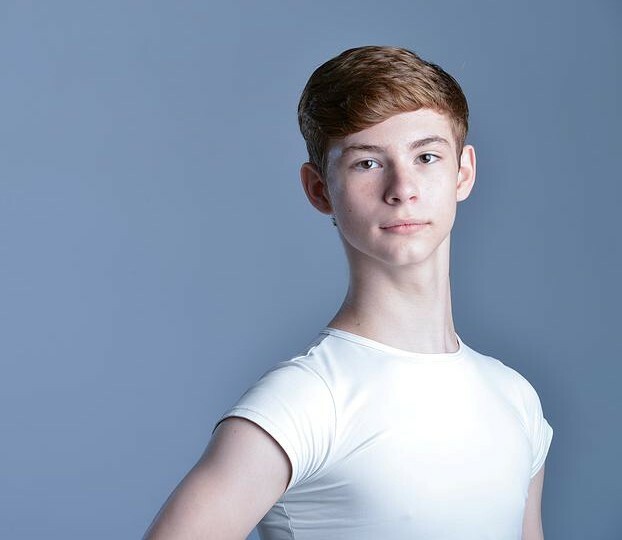 Orlando Ballet school student Blake Kessler was awarded first place in the Junior Grand Prix, the top award for all men and women age 12 to 14. Kessler and Briana Berrios won second place for Pas De Deux. The Children’s Trio from Vampire’s Ball placed in the Top 12 Ensembles. The Youth America Grand Prix, founded in 1999, is the world’s largest ballet competition that awards full scholarships and job contracts to dancers age 9 to 19. Many of the students that competed from the Orlando Ballet School in this year’s Youth America Grand Prix will also be perfoming in the Orlando Ballet’s Family Series performance of A MIDSUMMER NIGHT’S DREAM on Saturday, May 19 at 11 a.m. Tickets are $22 and $30. As a youngster, I nervously competed in some singing and piano competitions — but nothing more than bragging rights was ever on the line. For Orlando Ballet School students heading to the Youth America Grand Prix finals, though, there’s a lot more at stake: An award-winning performance could be a huge step toward a successful career. That pressure — and how the young dancers cope with it — is the subject of “First Position,”a fascinating documentary by Bess Kargman featured this weekend at the Florida Film Festival. Coincidentally, the Orlando Ballet School contingent will be in New York this weekend for the final round of the 2012 competition. Each year the students face larger challenges, says Dierdre Miles Burger, director of Orlando Ballet School. “Because the competition is getting more interest, there’s more talent competing — and it’s just gotten harder,” Burger says. “First Position” follows several promising young dancers as they prepare for the Grand Prix finals in 2010. The Youth America Grand Prix, founded in 1999, is the world’s largest ballet competition that awards full scholarships and job contracts to dancers age 9-19. “You have five minutes on stage to prove why you deserve this chance — and not somebody else,” says competition co-founder Larissa Saveliev in the film. The two are competition veterans: It will be Adrianna’s third trip to the finals and Blake’s fourth. Although the longer you attend the more scrutiny you endure, the students say. “When you’re younger, they judge you easier,” Blake says. The judges remember contestants from year to year and watch for signs of progress, Burger says. And the students are very aware at how closely they are being watched. The movie ups the drama with one student who suffers a foot injury shortly before the competition. That fear is in the back of the students’ minds, though they say they don’t dwell on it. “I get more worried when I practice that I’m going to get injured than when I’m outside,” Blake says. The title character of Broadway musical”Billy Elliot”is a young British boy who takes ballet lessons in secret, fearful of what friends and family might think. The Broadway touring production of the show, with music by Elton John, opens Tuesday at the Bob Carr Performing Arts Centre. Although the musical is set in the early 1980s, apparently times haven’t changed much when it comes to the stigma of boys and ballet. Fellow Orlando Ballet students Austen Acevedo, 12, and Arcadian Broad, 15, agree. “I was made fun of — ‘ballerina boy,'” Broad recalls. Unlike Billy Elliot, who keeps his talent secret from his rough-and-tumble father and brother, Broad at least had support at home. “I did dance in secret, from my friends, but not my parents,” he says. In the musical, based on the 2000 movie, Billy lives in a down-on-its-luck mining town in the north of England. He uses his ability to dance as an escape from his life. That feeling of escape is something Broad can relate to. The guys agree that bullying couldn’t stop them from dancing. “This is first priority,” Acevedo says emphatically. The three youngest all are schooled at home now, so they can devote more time to their dancing. Their work at the ballet school also provides them with a likeminded circle of friends. “I don’t have friends besides the people in the school,” Kessler says. The more experienced dancers they encounter also provide hope. “Looking up at older dancers, you know it gets better,” Kessler says.